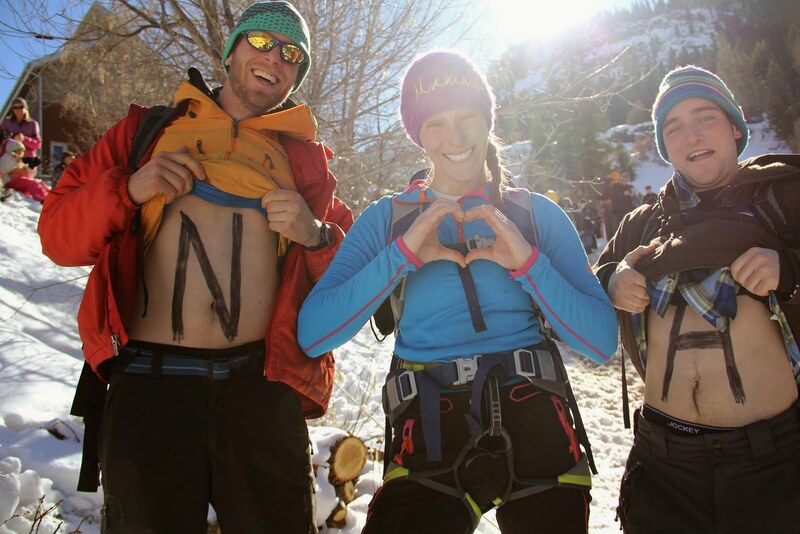 Jared Drapala & Adam Butterfield: Mammut NA love! "And do you ever sleep?" asked Megan Davin, one of Mammut's Customer Service Representatives. I had been explaining that I was headed to one more ice festival, number five this season, for four days. The Northeast ice season has pretty much come to an end, but the beginning winter months of traveling, competing, guiding, repping, and being around my favorite people have been one fantastic whirlwind. 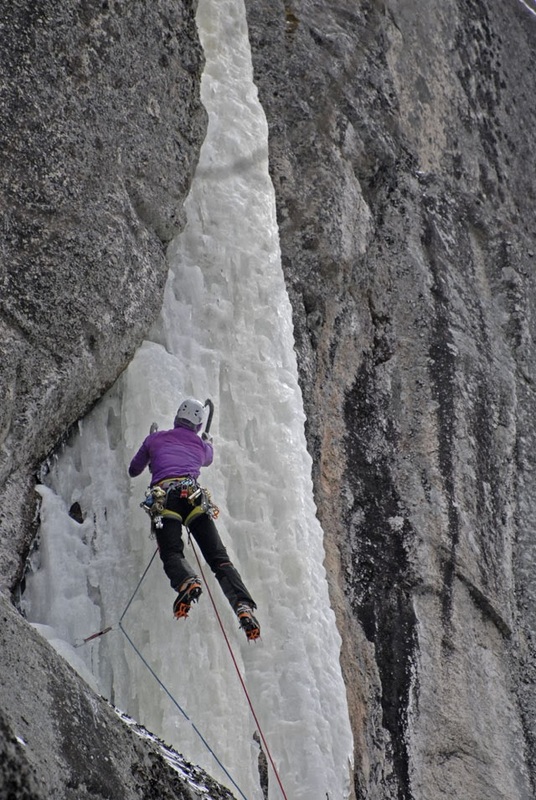 Ice climbing is not going to change the world. But in my clinics over the 5 ice fests, I had a neurologist, a classical pianist, EMTs, professors, students, an astrophysicist, and other amazing minds. Putting a smile on these faces- people who may just save the world- is my goal for every clinic. Teaching, explaining, encouraging, and smiling. I'd like to think I hit 64/64, and I have a lot of photos to back that up! In December I traveled to Bozeman, MT for their 17th annual Bozeman Ice Fest, and my husband Steve was able to join due to the low snow start (i.e. no ski guiding) to our winter in VT. Bozeman is one of my favorite places, and I was excited to be seeing and staying with some very good friends- Andrew, Alanah, Calder, and their three dogs, horse, and chickens. A proper farm right outside of town! Andrew had been a good friend in Vermont, and it was great to see him and climb again. We tore up some classic climbs in Hyalite- Horsetail Falls, The Scepter, Thrill is Gone, The Elevator Shaft and more... lots of great climbing. 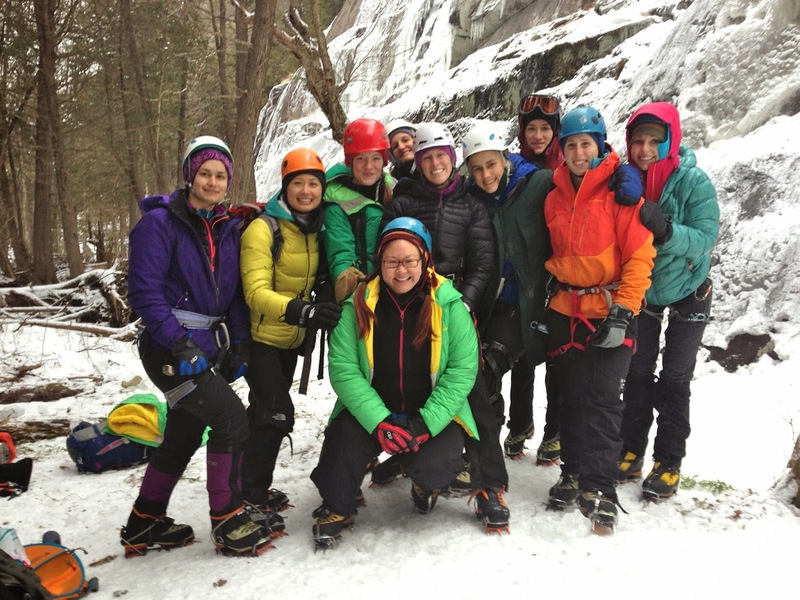 To kick off the festival, I taught a Women's Steep Ice Clinic with Majka Burhardt during Friday's "Women's Only" clinic day; a festival worker at one point commented that we had 40 women in various clinics out at the Genesis 2 area! We all did a bit of cross-instructing-- I helped one of of Ines Papert's participants on a mixed route understand what a dihedral was when Ines was at a lack for the English words. "That tiny corner right there!" I had also applied to compete in the BIF's mixed climbing competition this season. 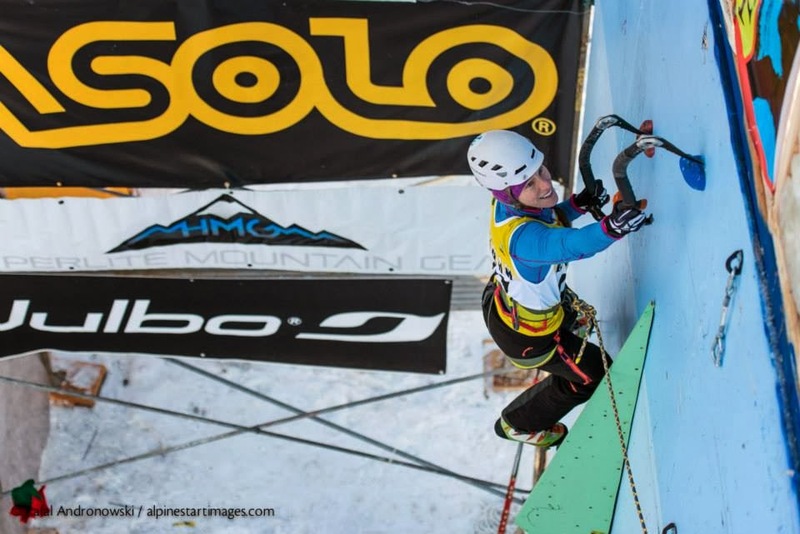 The UIAA North American Championships started off with two qualifying routes. On these routes, I felt strong, but not fast enough! I call myself a slow and precise climber, so my goal for future climbing- in the competition realm anyway- is to increase speed without losing precision. I was, however, having the most fun, evidence that photographer Rafal Andronowski captured of my ridiculous smile on not one but both qualifying routes. I didn't make it to finals, but got to watch the best climbers in the world in stellar performances. On to Ouray, CO for the 19th annual Ouray Ice Festival. Last year I was the total new kid in town, and this year was much less scary, knowing where the important things were (ahem, Wiesbaden Hot Springs) and generally how to get around. I brought two friends from Vermont, Kate and Brittany, the first trip to Colorado for both of them. They could handle climbing in the Ice Park themselves, but I was psyched to show them some backcountry "wild ice" and get high off the ground. This multi-pitch day ended up having to be our first day on ice, as it looked like a storm was rolling in, and I wasn't sure how the roads through Red Mountain Pass would be to Silverton (about a week later, a giant rock slide took out the road). Monday: 200 feet above sea level in Burlington, VT. Tuesday: 10,000 feet at the base of our climb, Stairway to Heaven. The ice was in good shape and we moved efficiently up 5 pitches. When we reassessed, we could all feel that "hey! welcome to altitude" fuzziness in our eyes and snow was rolling in, so we started descending and looked forward to getting back to Ouray for dinner. It was so much fun to be out with these two, and I'm so proud that they decided to continue their learning and do a rescue seminar with San Juan Mountain Guides during the Ice Fest. The weekend of the Ouray Elite Mixed Competition had come, and I had no excuses this year: it was 40 degrees and sunny, I wasn't climbing first, and I had previous knowledge of the route; however, I ended up popping off of Mighty Aphrodite about half way up the rock route. I was very frustrated with myself, but I was lucky to have a couple things to get me out of my funk and smiling again: a crew of friends with my name painted on their chests- the best cheering section EVER- and a really awesome group for a Women's Moderate Mixed Climbing Clinic. At the end of the festival, Dawn Glanc told me to come back next year, and I have a feeling that it's best when you do what you're told by Dawn. Women's Intermediate-Advanced Clinic- we got to do some mixed climbing! The week after Mountainfest required planning last minute details for VT's Smuggs Ice Bash: lights for the drytooling competition, t-shirt pickup, final emails to vendors, guides and volunteers, and much more... 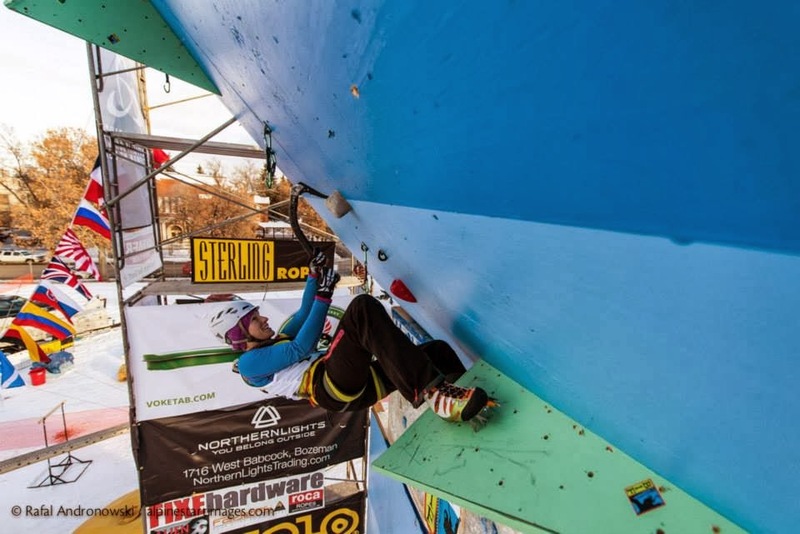 Right now we (Petra Cliffs, the climbing gym that I co-own with my husband Steve) host the only drytooling competition on the East Coast, and we had an awesome showing of competitors this year! 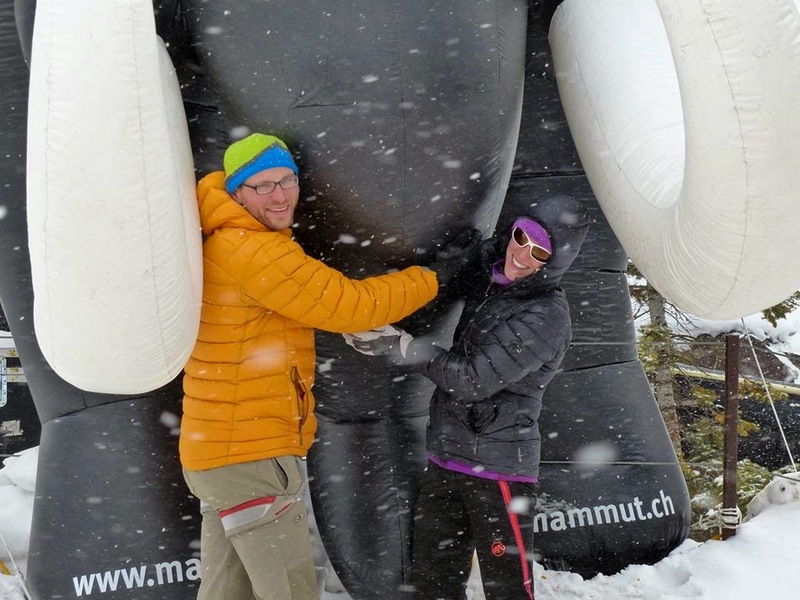 Mammut helped athlete Whit Magro travel from MT to compete (and WIN!) and teach, Will Mayo put on an epic shirtless performance, Lindsay Fixmer had a guest appearance, and many of our local East Coasters went big for the crowd. 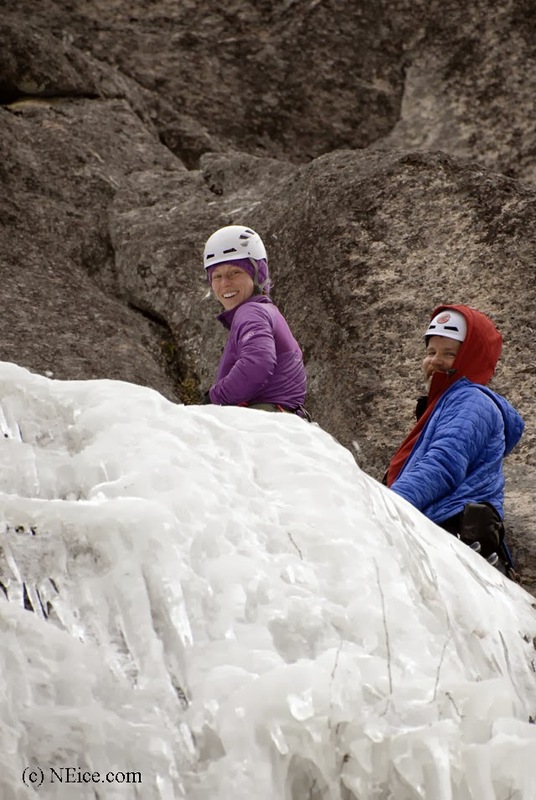 Smugglers Notch Dry Tooling Competition 2014 from Ross Henry on Vimeo. 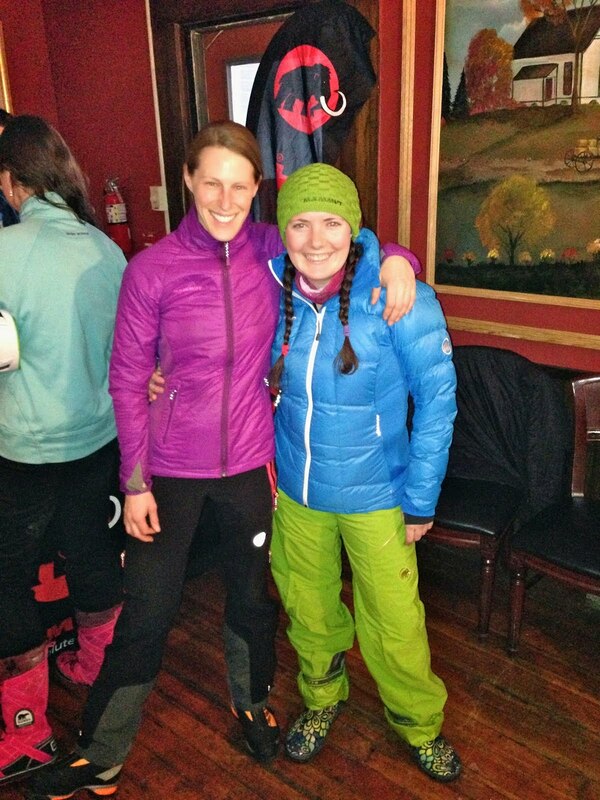 For the past number of years during the Smuggs Ice Bash, we have offered a free women's ice clinic. We began this offering when we were having trouble recruiting new female climbers, and now the waiting list is three times as long as the participant list. We're thankful to NEice for sponsoring this clinic, and putting smiles on so many faces! We are also very lucky to have Tim Farr taking on the majority of planning this year, and from what we're hearing from people who were involved, they want even more next year. It's very exciting to be a youngster in the ice festival world - only 8 years old- with so much potential and so many supporters already. There are times to be serious... and then there's the rest of the time. I finished out the festival circuit with the Mount Washington Ice Fest, its 21st year. MWV does a phenomenal job organizing, and they completely won me over with a free taco truck after guiding days. I had a busy weekend of handing out demo gear for Mammut, teaching clinics, and getting to climb a little for myself. 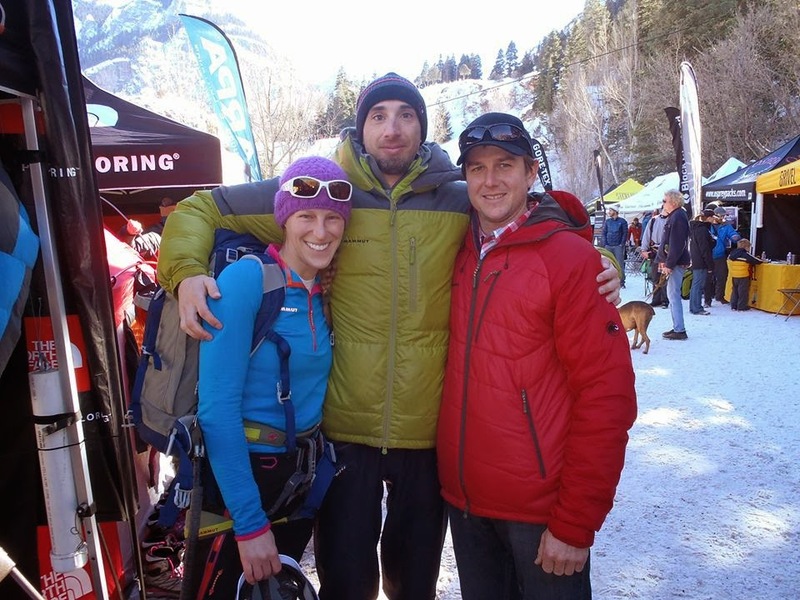 I taught a mixed climbing clinic with Bayard Russell, and a familiar face from the Smuggs Ice Bash, Zack Sawyer, had signed up for this clinic. This Georgetown student is really inspiring to me- his Instagram name is zackalwayspsyched - and he always tries so hard and always has a giant smile on his face. I also taught an "Intro to Ice for Rock Climbers" clinic with Carlos Buhler, and we created some new excited ice climbers. On Sunday I was going to casually wake up and mayyyybe climb something, maybe take a nap... I blinked and I found myself at the base of Remission (M6 WI 5+) on Cathedral Ledge with Alden Pellett and Glen Griscom from Camp/Cassin. I led the rock start and the classic steep column in the most beautiful NH weather- sunny, warm, windless- and I definitely wouldn't have traded that day with those two for a nap in even the most comfortable bed. I had gotten a bit homesick and missed climbing in Vermont, and it feels good to be home. I'm thankful for all of the opportunities I had this season to teach, represent Mammut, meet so many amazing people, and climb in some of the best venues in the world. Many thanks to my husband Steve too, for being so patient with me being gone so much. 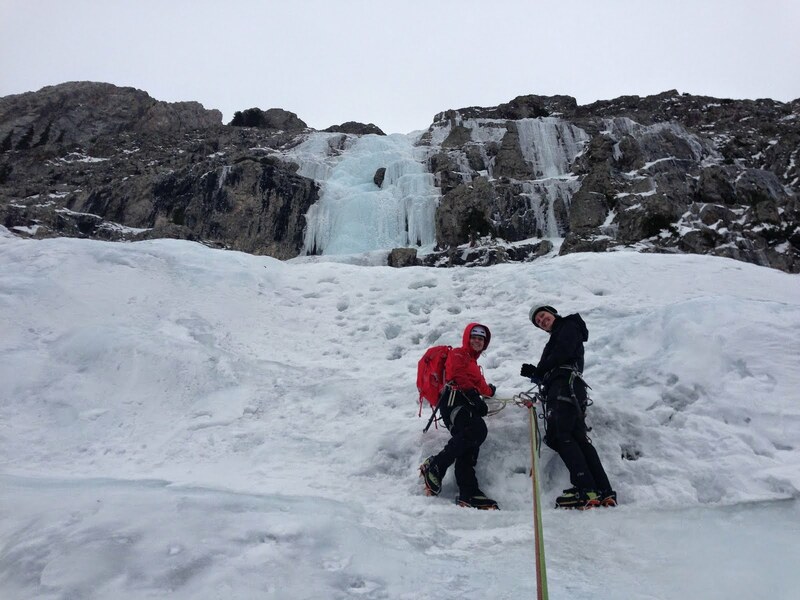 Next up: a Utah climbing Spring Break trip with Boston College!